Web of Science: What is icelandite and Iceland spar? What is icelandite and Iceland spar? 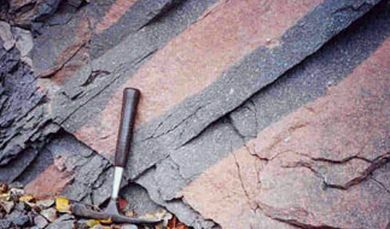 Icelandite is a type of rock, iron-rich andesite. The name was coined by the British geologist Ian Carmichael (who later became professor at Berkeley in California) while working around 1960 on his PhD thesis at a Tertiary volcano near the parsonage Thingmuli in E-Iceland. For continental cogenetic series of volcanic rocks it is generally the case that the concentration of iron decreases with increasing silica content, but at Thingmuli the opposite was true, leading Carmichael to the conclusion that the iron-rich intermediate rock deserved its own name, icelandite. Iceland spar, also known as optical calcite, is a very pure and transparent form of calcite (CaCO3). It used to be, and still is to some extent, used in optical instruments due to its exceptional double-refractive qualities. In the 18th and 19th Centuries the optical calcite from Helgustadir in E-Iceland was considered to be of outstanding quality and was in much demand by scientists and instrument makers, and hence the English name. 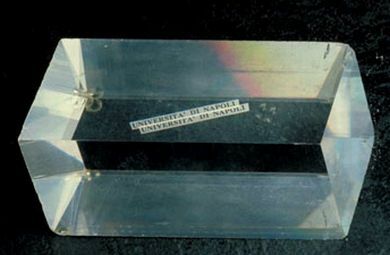 In the Natural History Museum in London there is a half-metre long crystal of Iceland spar, completely pure and totally transparent, through which the guests are invited to view the splitting up of the light. Sigurður Steinþórsson. „What is icelandite and Iceland spar?“. The Icelandic Web of Science 6.3.2005. http://why.is/svar.php?id=4807. (Skoðað 21.4.2019).